President Washington, used to myth-like idolization, is incurring the first vocal criticism of his life since his defeat at the Battle of Long Island in 1776, nearly 16 years ago. The brunt of his criticism comes from Washington’s efforts to centralize government power, predominately through his open adopts of the economic policies of Treasury Secretary Alexander Hamilton. Additionally, Hamilton’s advice has taken clear precedents over the advice of ideological rival Secretary of State Thomas Jefferson, who is becoming increasingly isolated and disgruntled. In fact, the followers of Hamilton are monopolizing the offices of the Washington administration. Part of Washington’s Federalist’s leanings involves foreign affairs. Their official ally France is undergoing a revolution of extreme violence, which not only disrupts trade, but threatens the establishment with fears of such violence occurring in America. Washington, like Hamilton, sees a return to a closer relationship with Britain as the best change for financial and governmental stability. Here, Jefferson is the odd man out again, as he favors closer ties with the French. In short, Hamilton is nullifying Jefferson’s influence at the State Department. Hamilton’s influence has led to the formulation of political parties. Those favoring Hamilton’s pro-business, pro-industrialization, pro-bank, pro-centralizing government are known as the Federalists. US Rep. James Madison has recently organized politicians opposed to most or all of these Federalist ideals and has elevated the more charismatic Thomas Jefferson as the leader of this opposition. In the North, George Clinton and Aaron Burr lead a Northern variety of this Jeffersonian Republicanism, which aims to appeal to the people, rather than to elitist authority. Despite this, Washington is still popular and seen as indispensable. Personally, he wishes to retire, but both Federalists and Jeffersonian Republicans urge Washington to run for a second term as the country eases into a relationship with a home-grown federal government. As such, Washington is expected to win unanimously once again. The real race is for the vice presidency, and the occasional quasi-monarchist comments by John Adams makes the incumbent VP open to attack by Republicans, who hope to elevate Northern Republican NY Gov. George Clinton to the position. As expected, Washington won a vote from every delegate. The delegates had a harder time considering their chose for VP, but as was probably likely, Adams won reelection, but at a much smaller margin than he had won by in 1788/1789. George Clinton made a respectable showing, and Thomas Jefferson and Aaron Burr receives some token votes. 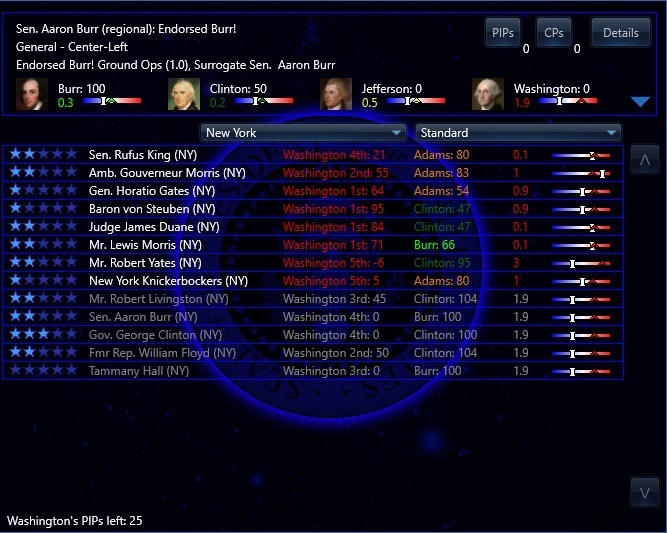 Play as George Clinton and see if you can upset the Federalist dominance of the executive branch by defeating John Adams. 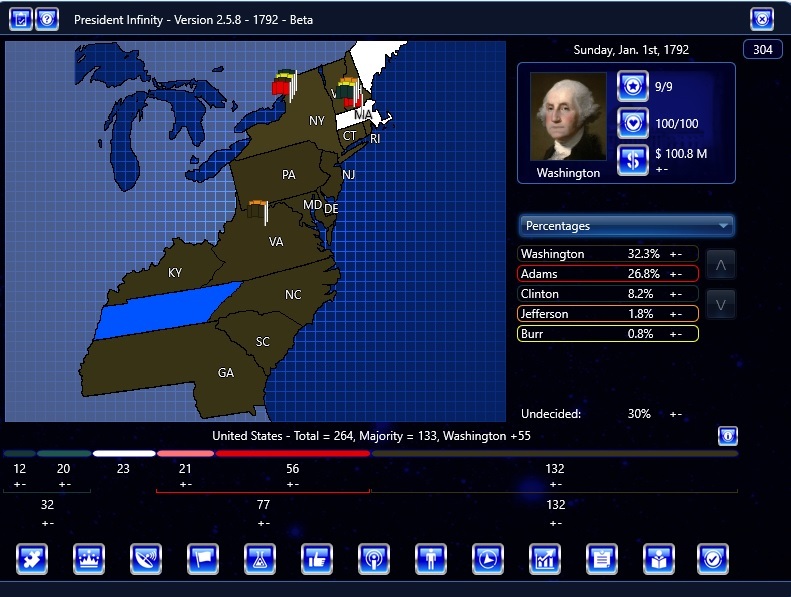 Play as John Adams and see if you can win every electoral vote, tying Washington, and sending the election to the house. Play as Thomas Jefferson or Aaron Burr to see if you can be a tougher rival than George Clinton was for John Adams. Play as the Simulation Party and watch the CPU play through the election. Why not play as many of the what-if candidates (see below)? What if these candidates had launched a campaign? What if popular Rev War General Artemas Ward ran. Politicians were surprised with his natural political ability. What if the aging Rev War patriot Samuel Adams ran as a Jeffersonian Republican alternative to his cousin John Adams? What if Samuel Huntington, arguably the most powerful man in Connecticut, had run? What if the impressive and multifaceted Chief Justice of the Supreme Court John Jay decided to run? What if former Supreme Court Justice John Rutledge decided to represent the Deep South on the presidential ticket? What if the famous Patrick Henry ran an opposition candidacy to John Adams? What if Richard Henry Lee ran? Could he have a shot with flashier Virginians in the running? What if future nominee, and former Rev War general, Charles Coatesworth Pinckney ran in 1792? What if the ambitious treasury secretary Alexander Hamilton opted to join Washington on the ticket? What if the “Financier of the Revolution” Robert Morris had run? 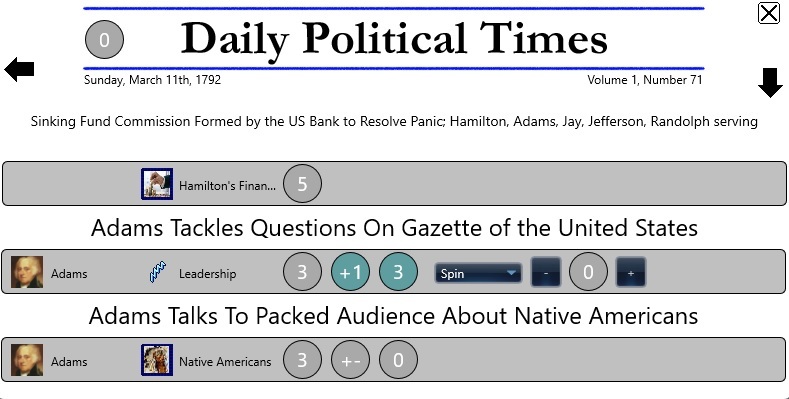 What if the leading voice of opposition in the US House, James Madison, had run in 1792? What if the most vehement critic of the government, William Maclay, ran an insurgency candidacy? What if the famed John Hancock positioned himself as the better Massachusetts man for the vice presidency? What if Supreme Court Justice James Wilson, the only man to call for a popular vote at the Constitutional Convention, ran for the vice presidency?